Matcha powder is finely-ground Japanese green tea leaves. You can purchase it in Asian stores, coffee/tea shops, many grocery stores, or where ever fine tea is sold. Preheat oven to 350°F. Line a 12-cup standard muffin tin with paper liners; set aside. In a large bowl, combine flours, baking powder and salt. In bowl of an electric mixer fitted with paddle attachment, beat butter and sugar on medium speed until light and fluffy, about 1 minute. Beat in eggs, one at a time, until well combined. Beat in vanilla and lemon zest until well combined. With mixer on low speed, add dry ingredients and green tea alternately in 3 parts, beginning and ending with dry ingredients, beating just until incorporated. Scoop batter evenly into muffin tray. Place into oven and bake for 13 to 15 minutes, or until a tester inserted in center comes out clean. Remove from oven and cool completely on a wire rack before frosting. To prepare frosting: In bowl of an electric mixer fitted with paddle attachment, beat cream cheese and butter on medium speed until light and fluffy, approximately 1 to 2 minutes. With mixer on low speed, gradually add powdered sugar, beating just until incorporated. Add matcha powder and lemon zest. Increase speed to medium high and beat until frosting is light and fluffy, approximately 1 to 2 minutes. 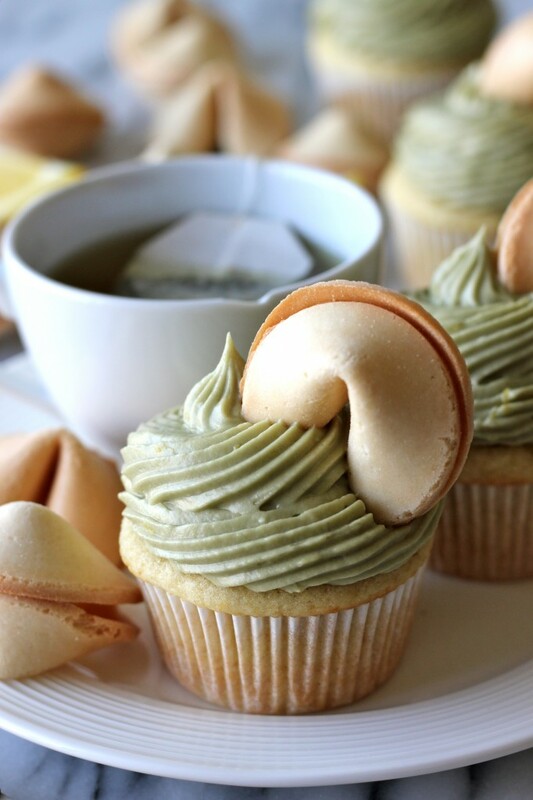 Use a small offset spatula or a pastry bag fitted with a decorative tip to frost cupcakes, garnish with fortune cookies, if desired.